DHL Global Forwarding and DHL Freight have started of construction of the new DHL Campus at Vienna Airport. The two divisions are building a freight hub for Austria and Eastern Europe on the site in the municipality of Fischamend. DHL Global Forwarding and DHL Freight are each building an advanced freight terminal and an office building with a total of around 12,000 sq m of warehouse space and around 3,500 sq m of office space on the property in the municipality of Fischamend. This will pool competencies for air and ocean freight as well as land and intermodal transport centrally at one location and create new, larger capacities for cargo. “With the new building in the Vienna airport region, we will further improve the quality of our Europe-wide general cargo network Euroconnect and our premium LCL service Eurapid. Innovations such as digital yard management will also be implemented at the new site.” said Horst Sorg, Managing Director Austria at DHL Freight. 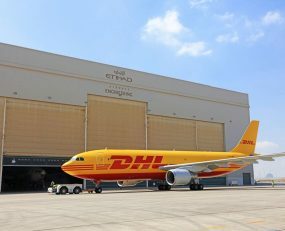 Completion of the new DHL Campus Vienna Airport is scheduled for the first quarter of 2019. Around 250 employees will then dispatch and consolidate freight at the new location. The sustainable design and use of renewable energies will directly contribute to Deutsche Post DHL Group’s goal of reducing all logistics-related emissions to 0% by 2050.